Tons of new features! You need to check it out! 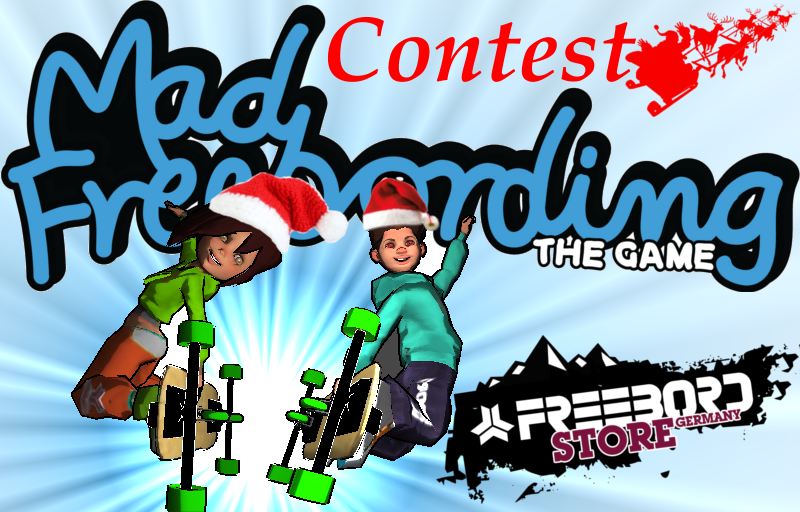 Brian from Freebord Germany Store is going to sponsor a little contest to celebrate the beta release! To attend the contest create an account in Mad Freebording AND PROVIDE A VALID E-MAIL address, where your prize can be send to. To win be the most respected rider of the game at 12:00AM [GMT + 2:00] 15th of December! 1. Play the story and unlock the Global Respect Ranking for your account. 2. Continue playing! Every finished level will increase your respect. 3. Ride fast, make huge tricks, crazy grinds and grabs, the more SCORE you make the more RESPECT you get! Here is a list of the features which will be done next for Mad Freebording. They are sorted by priority the first in the list will be implemented next. Feel free to give feedback, ask for new features or comment on the feature order on this list.